(Talladega, AL—APRIL 25, 2018) — NASCAR Monster Energy Cup Series team owner Rick Ware and American professional stock car road racing driver Kevin O’Connell join national television host Eric Bolling to launch the “Race To Erase Opioids” campaign and unveil a specially-messaged & wrapped race car at the Sunday Geico 500 NASCAR race at Talladega Superspeedway in Alabama, it was announced today. Two years ago, professional driver Kevin O’Connell decided to try something different. The Houston native made history in the process. In 2015, O’Connell became the first driver to race in all three NASCAR international series (in Canada, Mexico and Europe). O’Connell, 48, mainly competes in races designated as road course events. In 2013, he entered the American SpeedFest at the Brands Hatch Circuit in Great Britain. Since then, O’Connell has competed in the NASCAR Canadian Tire Series at Canadian Tire Motorsport Park in Bowmanville, Ontario. He also has been to Mexico with the NASCAR Mexico Series and to Europe with the NASCAR Whelen Euro Series. O’Connell grew up in Clear Lake and graduated from C.E King High School, where he was a three-sport athlete in baseball, basketball, and track and field. He has been around racing his entire life. His father, Gus O’Connell Jr., raced cars in Huntington Long Island, N.Y., and in the 1960s competed in regional races for the Sports Car Club of America. Kevin O’Connell fell in love with driving in the late 1980s while participating in street races on Rankin Road. He drove a blue Ford Mustang and was joined by 500 car enthusiasts who shared his passion. It was that passion that led him to become a NASCAR driver. 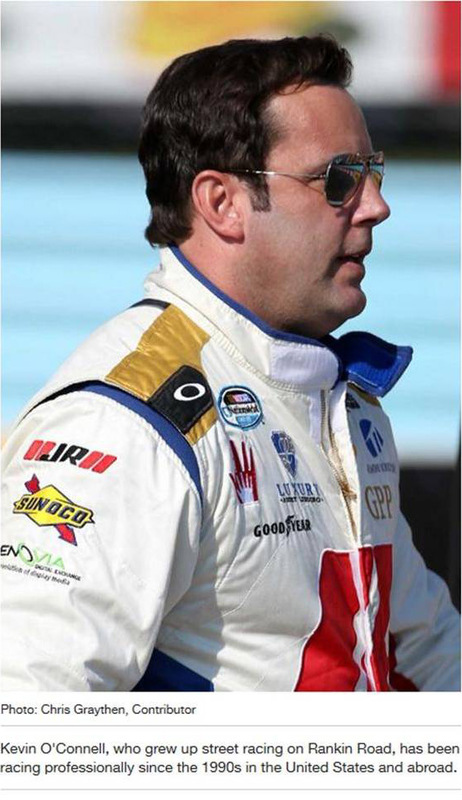 O’Connell has been racing professionally since the 1990s and has competed in the Xfinity Series for NASCAR. Also, he has driven road courses like Road America in Wisconsin. In 2014, he finished third at Gardner Denver 200 (at Road America) and was named the Mobil 1 Driver of the Race. He calls the race his signature moment. O’Connell has continued as a road course specialist. His unique schedule allows him to join different teams. Recently, he signed on with Rick Ware Racing to compete in the Xfinity Series and Canadian Tire Series races. He also is looking to compete in the Tudor United Sports Car Championship series, which is organized by the International Motor Sports Association and runs in Canada and the United States. O’Connell also has experience with sports cars. He has raced in the Rolex Series and the IMSA Blancpain Lamborghini Super Trofeo Racing Series. In the IMSA series, O’Connell drove the No. 9 Lamborghini of Houston and finished second in the series. He plans on competing again in the future. One of the series O’Connell races in is the NASCAR Mexico Series. It is a popular circuit that NASCAR has tried to build around and is seen as a steppingstone for Hispanic drivers to reach the Xfinity or Sprint Cup series in the U.S.
NASCAR has showcased the Mexico Series in the U.S. by holding a race at Phoenix International Raceway since 2014. Many drivers have come from Mexico and competed in the Xfinity and Sprint Cup series. For Daniel Suarez, the series has helped him achieve the dream of being a NASCAR driver. O’Connell has seen firsthand the talented drivers in the Mexico series. He raced in the Toyota 120 at Phoenix International Raceway and is headed to Mexico City to race in November. O’Connell has come a long way from Rankin Road in Houston. He hopes to continue his international success.